Over the weekend, I was at USC helping out with a film school project. We spent Saturday discussing the project and getting the puppets ready, and then we spent Sunday shooting on a sound stage on the USC campus. We are not done yet. There will be more scenes to shoot next weekend. I was first contacted by my friend Dave, who was attending film school at USC and was the producer of the film. I then met the writer/director Michael and went over some ideas. 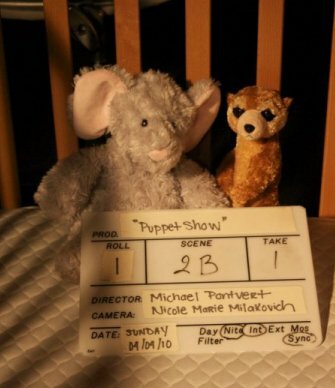 It was about a man grabbing stuffed animals to put on a little puppet show to rehearse for his new role as a new dad, so we used stuffed animals as puppets. The director brought the cast (a bunch of stuffed animals) and for the main character, he even brought three identical ones. We ended up keeping one unmodified, cutting one open (which didn’t make me cringe as much as I thought I would) to make into a puppet, and modified the ear of one of them based on the storyline. Also, the main character was an elephant, so we also put a piece of a wire hanger into its trunk. That way, we could control the angle and the shape of the trunk. Then there came the shoot date. I arrived at the studio while Dave, Michael, and the DP Nicole were adjusting the lights. It was an interesting experience for me to watch them work, because I got to see how the lighting changed the shot while they made the adjustments such as moving the lights around, changing the levels, using the barn doors and clipping gel to the lights. When it comes to video productions, I’ve never been good at the lighting aspect, so it was a good opportunity to watch them and pick up a thing or two. Then we filmed. It was a fun shoot, as all shoots involving puppets should be. I realized there were good things and bad things about the habits that I’ve developed. After taking classes for TV puppetry, this left-is-right and right-is-left thing has already become second nature to me. I have no trouble at all moving and tilting the puppet to whichever spot I want in the shot. The downside with the training, however, is that I’ve gotten into the habit of breaking the fourth wall (talking to, looking into the camera directly) while I am not supposed to. 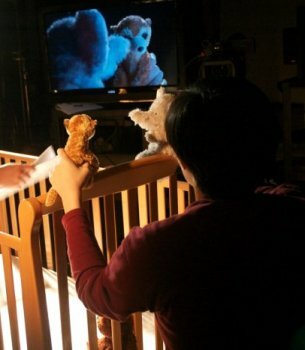 On Sesame Street or similar puppet shows, characters often directly interact with the camera as a way of including the kids watching, or use the technique to emphasize things. While it was a good thing to do in many cases, it can also make them very narcissistic puppets! The director pointed out the eye line problem a few times and I had to more consciously watch out for this problem, since looking at the camera is not always appropriate for every situation. So that was another thing that I would watch out for in the future (that includes our next shoot on Saturday). Just to make the day more interesting, there was an earthquake during the shoot. The epicenter was in Baja California, Mexico, we could feel it in Mexico too. When it first happened, the other people were setting up a shot and I was making modifications to a puppet. At first we weren’t even sure if we were just dizzy or it was an earthquake. Michael and Nicole had never even experienced an earthquake before so this shall go down as an unforgetable day for them. As for me, somehow I’ve always lived in places that has earthquakes (Taiwan and California) so it isn’t entirely new to me. That looks like a lot of fun! Will we get to see the video? At least a short clip? @Melissa: Probably. Don’t know when they’ll actually finish it. @Katrina: Why, you’ve never mentioned the cannibal side of you. What fun! I personally have no problems opening up toys to make use of them… it’s only pillow stuffing (or beads) after all. I think it’s sort of like a med student who thought he would be afraid of blood, but actually realized it was fine at the first surgery. Knowing that you can just repair it also helps. Haha, thanks for catching the typo. That kind of jitter is more excitement than fear though!